Improvements:Archibald Water has been run down Grant Dr. Lots have been surveyed and some dirt work done. Comments-These are really nice house lots with covenants recorded at clerk of court with minimum 2000 sq ft heated houses. 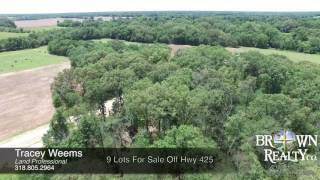 Very nice high rural lots only minutes from I20 and Rayville. Not many opportunities to purchase such nice lots. Located in the Mangham School Zone. Come take a look.